We’ve combined the power of You.i Engine One with React Native. You.i Engine One is a video experience framework that delivers cross-platform user interfaces from a single codebase. You.i Engine One was built with TV and media-specific features in mind, including a common video player interface, DRM integrations, and more. 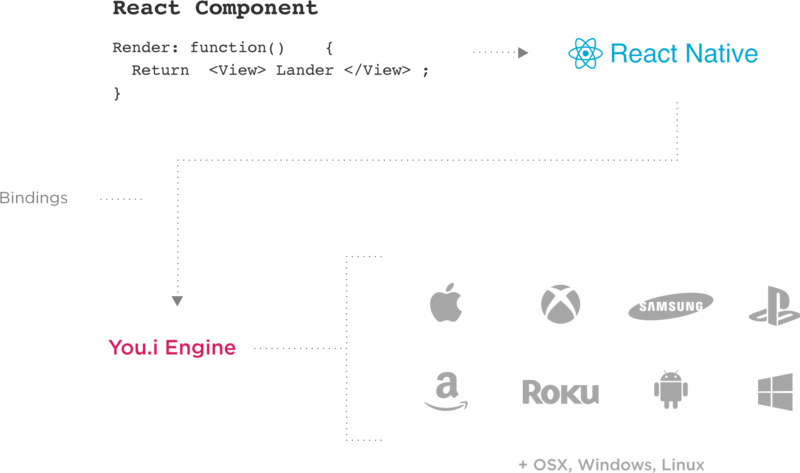 And now, You.i Engine One combines with React Native for the ultimate developer efficiency and designer freedom. 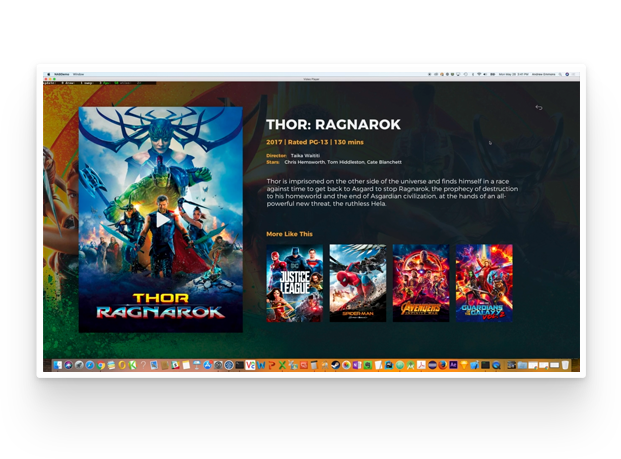 Leverage a hardware-accelerated rendering engine that delivers fluid UI across mobile and TV platforms – including iOS, Android, Roku, Amazon Fire TV, and Xbox. Our integration with JSX means your teams can use their existing design tools or use our powerful animation tooling to help deliver premium interactive experiences. Get the flexibility of common RN components and native modules with the efficiency of a single codebase. Developers are free to use their preferred IDEs and tools for app development, profiling, and testing, ensuring efficient use of their time and effort. You.i Engine One contains everything you need to make VOD and Live TV apps. A full suite of components including playback, DRM integration, and 3rd-party integration adapters. Harness React Native and its quickly growing ecosystem to develop apps by offering JS bindings on-top of the C++ foundation. You.i Engine One is a complete application framework that offers maximum code reuse through the use of platform independent controls and libraries. Achieve true native performance through an abstracted rendering pipeline that supports OpenGL, OpenGL ES, DirectX, and Custom Graphics APIs to consistently deliver rich experiences across every screen. Ability to leverage native libraries and user interface controls within your cross-platform application including prebuilt access to common platform capabilities. Use the RN tools you know and love or go beyond the realms of JSX-defined design and into a world where layouts and motion are exported into your React Native app without limits or loss. We combine the power of Adobe with the You.i Engine AE exporter which allows designers to compose layouts, skin screens, add interactivity, and animate with ease and control. Elevate your app to a world-class experience with branded animations, beautifully fluid loaders, page transitions, button sequences, swim lanes, and promotions. Create responsive screens by setting layout anchors and type breakpoints so your UI adapts perfectly to any device type including mobile phones, tablets, streaming pucks, and TVs. All screens and UI elements are exported directly into the application codebase creating a user experience without any loss or development effort in the handoff from designer to developer. No mountain of devices needed. Designers are enabled to simulate real-world conditions & devices. Preview animations, layouts, and content without touching a line of code. Configure your app to retrieve and update UX elements, including layout, styling, and motion, dynamically from the cloud. A powerful application panel for accessing tools for analyzing rendering performance, resource consumption, and focus navigation. Use the native platform IDEs and tools of your choice for application development, profiling, and testing. A configurable cross-platform build system that integrates with native build tools and enables simple integration of 3rd-party and user interface behaviors. Support for automated testing using a cross-platform Appium solution. Native player support including AVPlayer, ExoPlayer CastLabs, and UWP Media Player. Streaming support for MP4, HLS, Smooth and Dash. Leverage abstracted integration APIs so you can use pre-integrated services or connect custom back-end services including online video platforms, content management systems, authentication, entitlements, commerce, payment gateways, and analytics. Full support for VOD, and Live Linear streams including playback controls, scrubbing, state-based play, volume, bookmarking, subtitles, closed captioning, and player surface transformation. In addition to supporting many React Native components and properties out-of-the-box, You.i Engine One supplies its own set of components that are optimized for use with You.i Engine. Developers are free to use their own custom components or develop new ones. You.i Engine One libraries provide the user interface, app components, rendering, and platform services functionality. Developer workflow is generally the same as typical React Native workflow, with the optional ability to define UX look and feel via our After Effects (AE) exporter.